President Adama Barrow swore in six new Gambian judges at his office in Fajara today. 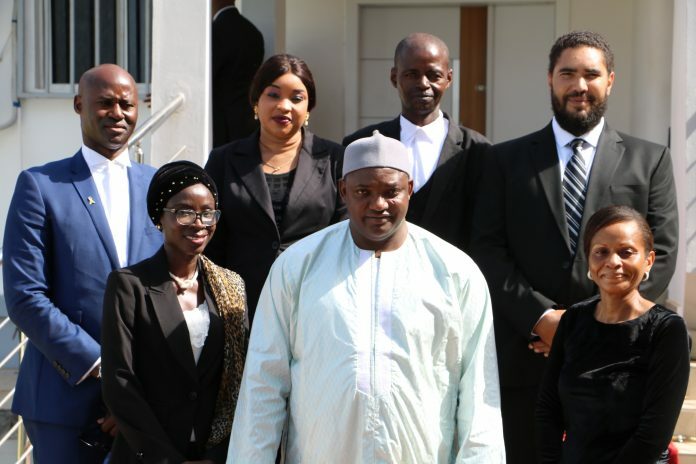 The President said that appointments of qualified legal experts would ensure that in future, the entire Gambian judicial system would be efficiently and professionally managed by qualified Gambians. The President called on the judges to uphold virtues of integrity and professional ability, and to command trust and respect through their conduct. He encouraged them to preserve public confidence in the competence and independence of the judicial system. Mr Barrow also reminded the judges that citizens rely on the law, and that the oath they took requires that justice be done according to the law, without discrimination. President Barrow assured the new judges that his administration would continue to create the conducive environment for them to deliver on their mandate without any interference from the Executive branch. He urged them to maintain impartiality and be fearless in the administration of the law. Speaking on behalf of his high court colleagues, Justice Ebrima Jaiteh expressed gratitude to President Barrow for giving them the opportunity to serve as judges. He reminded his colleagues of the qualities of an upright judge, and advised that they be guided by justice in executing their functions. Chief Justice, Hassan Abubacarr Jallow also enjoined the new judges to uphold the virtues of professionalism and integrity in their work. The new judges are: Honourable Justice Awa Bah as President of the Court of Appeal,and Justice Haddy Cecillia Roche, Justice Basiru Vassili Portier Mahoney, and Justice Kumba Sillah-Camara,as Justices of the Court of Appeal. Justice Buba Jawo and Justice Ebrima Jaiteh were sworn-in as Justices of the High Court. The appointment of Justice Awa Bah marks the first time that a woman has been appointed as President of the Court of Appeal. Half the number of new judges sworn-in today is women. The appointments reflect President Barrow’s commitment to promote gender equality in decision-making positions. Foreign Minister Ousainou Darbo, members of the Judicial Council and other senior officials also attended the swearing-in ceremony, which was moderated by Secretary to CabinetIsatou Auber- Faal.